This entry was posted on Friday, April 6th, 2012 at 2:50 am and is filed under Creative Blocks, Dealing with Criticism, Getting Support, Uncategorized. You can follow any responses to this entry through the RSS 2.0 feed. You can leave a response, or trackback from your own site. So, is Sam a blocker for Murray? Yes, Sam is eyeing Murray’s clear enthusiasm with deep suspicion. Or that is my interpretation! Murray as a kitten was a terror which is why we nicknamed him, Osama Bin Crazycat. He has since mellowed out–a tad. 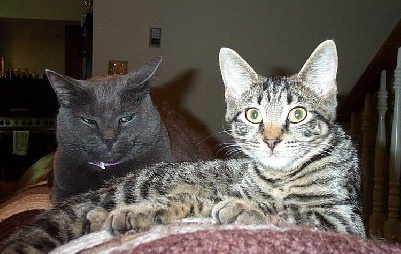 Sam was and remains the head cat, and introducing a crazy kitten into the household took some adjusting for the always steady and somewhat staid, Sam. They made a truce of sorts, as you can see from the photo above, which I entitled Trust but Verify. Interestingly, we adopted Murray, as well as the rest of the litter, from a nearby Buddhist temple where folks abandon their cats with the hopes that the residents at the temple will care for them. We found homes for Murray’s brothers and sisters, most of whom reside in NYC. Anyone want a cat or 4?—there are a number of kitties at the temple for whom I’d love to find homes and they are almost as cute as Murray. Thanks, Avi! I think we all need to keep creating! I absolutely love this post (and the photograph. Adorable!). It’s so true. I am so blessed to have found a group of brilliant people I can check in with for creative nourishment, and I count you among them. Thanks, Margaret (and the photograph was just so perfect for this post, I couldn’t resist!) I count you among the nourishers, too – and we need all the help we can get!